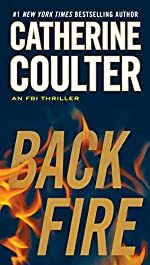 Synopsis (from the publisher): San Francisco Judge Ramsey Hunt, longtime friend to FBI agents Lacey Sherlock and Dillon Savich, is presiding over the trial of Clive and Cindy Cahill – accused in a string of murders – when the proceedings take a radical turn. Federal prosecutor Mickey O'Rourke, known for his relentless style, becomes suddenly tentative in his opening statement, leading Hunt to suspect he's been threatened – suspicions that are all but confirmed when Hunt is shot in the back. Savich and Sherlock receive news of the attack as an ominous note is delivered to Savich at the Hoover Building: YOU DESERVE THIS FOR WHAT YOU DID. Security tapes fail to reveal who delivered the tapes. Who is behind the shooting of Judge Ramsey Hunt? Who sent the note to Savich? And what does it all mean? Savich and Sherlock race to San Francisco to find out … watching their backs all the while.